Increase staff efficiency, reduce equipment costs, and improve customer satisfaction. Aruba's asset tracking solution helps organizations increase staff efficiency, reduce equipment costs and improve customer satisfaction. Businesses can track assets by leveraging the value of their location-ready Aruba WLAN infrastructure and BLE-based Aruba Tags. Aruba's real time-location system (RTLS) for equipment and asset tracking enable you to quickly and cost-effectively monitor and pinpoint where high value assets are – like wheelchairs, IV pumps in healthcare, or a pallet of goods in a warehouse. The Aruba Tags Configuration App turns any iOS smartphone or tablet into a mobile tags configuration device. Just scan the QR code on the back of the tag, and enter the relevant data to create a real-time database. If your primary goal is to track high-value physical assets, then Bluetooth Low Energy asset tags are the way to go. 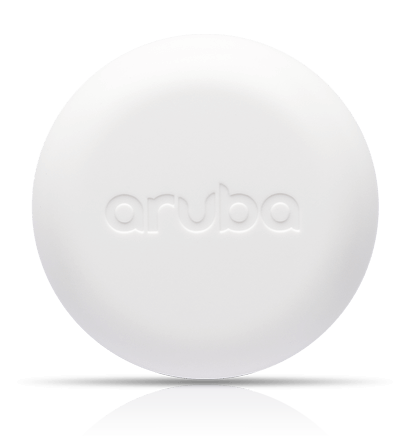 BLE-based Aruba Tags and location-ready Aruba access points ensure you can find things fast, indoors and outdoors. Maximum signal range depends on the physical environment. Aruba Tags operate on the same type of radio waves as 2.4GHz Wi-Fi routers. As a result, the signal can be diffracted, interfered or absorbed by materials in the space such as metal, wood or water. For country specific regulatory information and approvals, please see your Aruba representative.